Frozen peas work well in a pinch, but when the fresh peas in their cozy pods are in abundance, it is more than worth the effort of shelling them. Planning a nice meal for my best friend Basil, who looked after my kitty while I was away, I wanted to make something rather special and nourishing. He did get to try my Home -Style Chila (no luck finding anything like it in London Indian restaurants) and then on the weekend I treated him to this wholesome pea curry, along with a mixed dal and a bed of buttered and pepper rice. Once again, I consulted my copy of Sukham Ayu by Jigyasa Giri and Pratibha Jain. I have so many bookmarked recipes to try and as I mentioned in a previous post, my curious mind wants to learn more about vegetarian Ayurvedic cooking and philosophy. 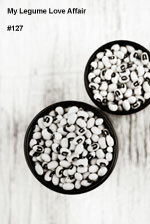 The ingredients for the recipes are easily obtained, especially if you have access to an Indian grocery store. This is surely an ideal book for home cooks and those wishing to learn more about the exquisite flavours of Indian cuisine and the healing properties that provide a proper balance for vegetarians. Heat 1 teaspoon of ghee, butter or oil in a wok or a heavy-bottomed pan over medium heat. When hot, add the onions, garlic, ginger, red chilies and pumpkin seeds. Sauté for a few minutes and remove from the heat. Remove to a spice or coffee grinder or small food processor, add the coconut and a little water, and grind or blend into a fine paste, adding water if necessary. Meanwhile, boil the peas in a small saucepan of water for a few minutes until just tender. Drain and set aside. In the same wok or pan used for the paste, heat a tablespoon of ghee, butter or oil over medium-low heat. Add the paste to the pan, and stir and fry for a few minutes. Now add the turmeric, coriander, cumin, chili powder and cayenne, and stir and fry for another few minutes. Add the boiled peas to the pan along with the mint leaves, salt and 3/4 - 1 cup of warm water, depending on the desired consistency you wish to achieve. Cover and simmer for 5 - 10 minutes. Garnish with fresh herbs and a sprinkle of garam masala. 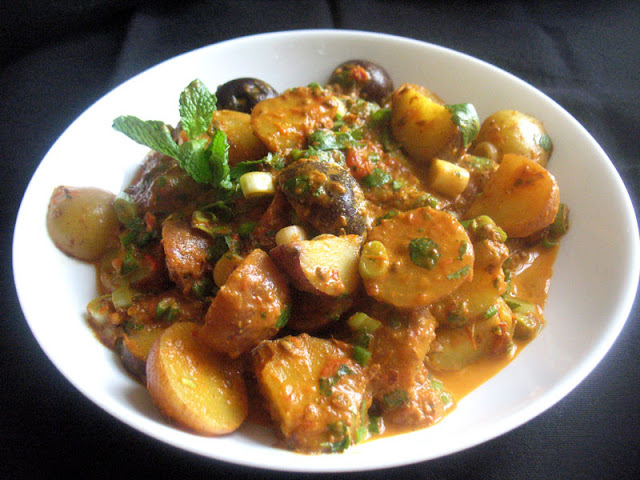 Remove from heat and serve hot, garnished with fresh coriander or parsley and a sprinkle of garam masala. 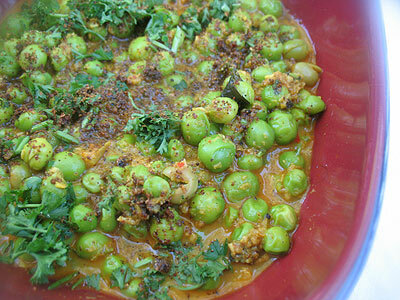 we used to get this green pea and methi dry curry from our local restaurant when we lived in India. A good option when you're fed up of all the over-masala'd other offerings. It was fantastic! This looks wonderful too. 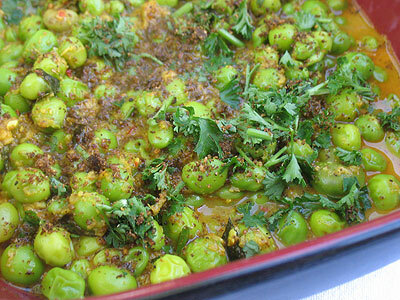 Superb, green peas curry is just perfect with hot phulka's.. This was really, really good. I would have trouble making this from fresh peas Lisa. I would want to eat them all and not have enough left over.